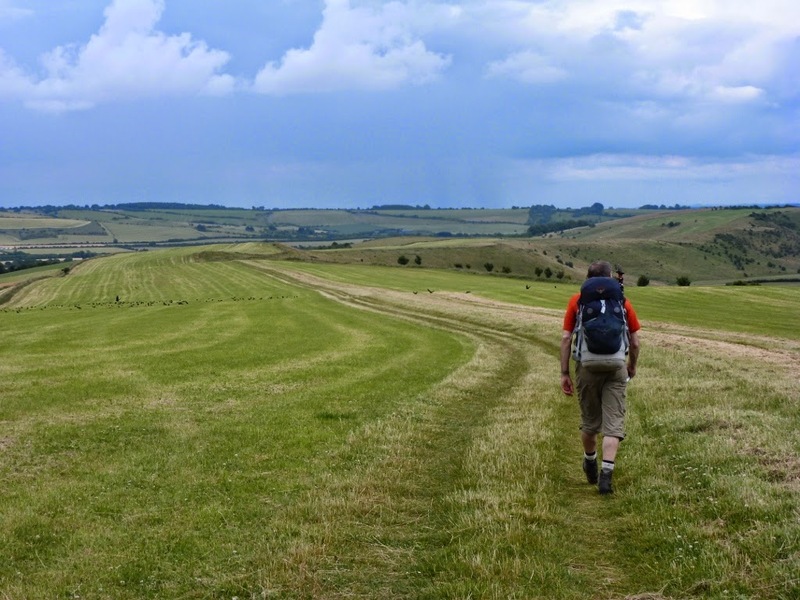 I rather dislike long distance walks in the summer, and I’ve never been especially keen on the national trails of the southerly parts of Great Britain. The plain fact is that they lack solitude. Every few miles it seems there is a road, and a car park, with its attendant rubbish, cans and about 200 yards of dog poo extending in either direction along the trail. That and the fact that many southern landowners seem to resent anyone straying inches from the strait and narrow, so they closely hem in all public paths and byways with a range of barbed wire barriers that could outdo the Western Front in 1916. However, between the glorious days of spring and the cool days of autumn there is a hiatus in my personal walking calendar. 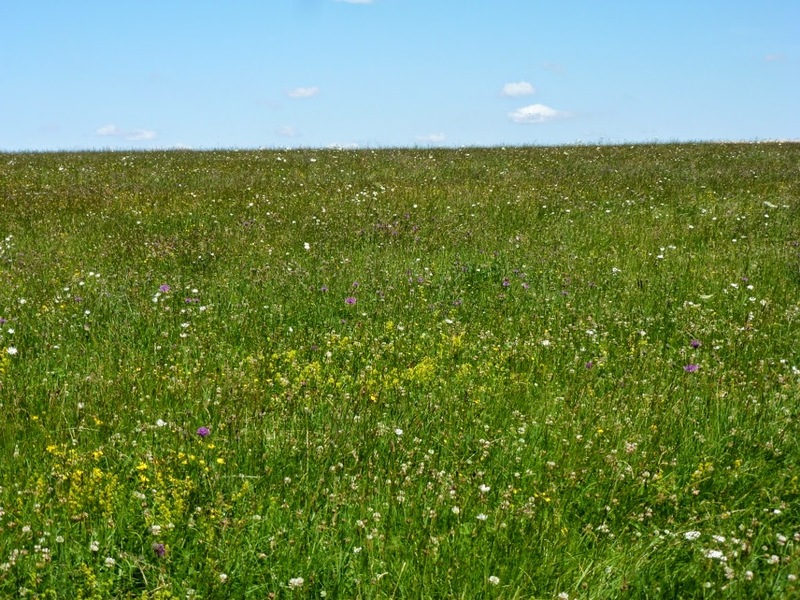 The Alps, Picos and the Pyrenees are heaving with hikers, and the refuges become places to avoid – especially the fly blown latrines. Scotland and Scandinavia are plagued with midges, and often sweltering too. And so I tend to a period of summer sloth; just a six or seven miler on a Sunday, and couple of mornings doing our charity dog walking (not too onerous now poor old Alfie the help-dawg has a gammy leg). I succumbed, although the bit about the pubs and the tea shop turned out to be overly optimistic. 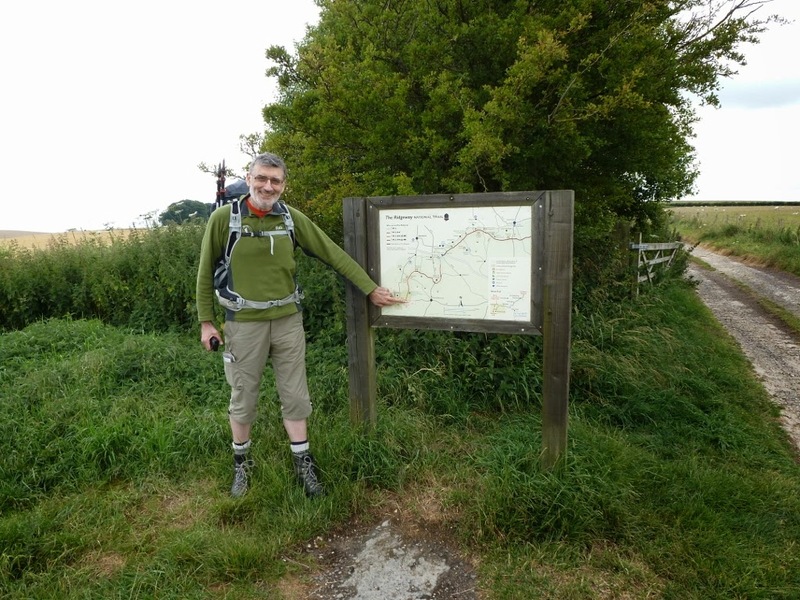 On Tuesday 8th July I arrived at the car park on the Ridgeway at Bury Down, just south of Chilton. Al’s car was already there. I saw several official looking notices saying “No overnight parking”, so parked the old beemer by some bushes at a discreet distance from the road. As it transpired, this was not discreet enough – but more of that later. Soon we were whizzing off to our start point at The Sanctuary car park on the A4, just SE of Avebury, with its ancient stone circle and avenue. 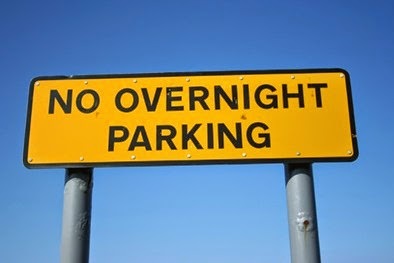 This car park too is festooned with “no overnight parking” notices. These though are of a more half-hearted computer printout variety, badly laminated and stuck to the fences like wind-blown litter. I really don’t get it. It’s not as though these places are going to be chocca at 3am is it? Are walkers expected to leave their cars on the unlit verges of the A4 instead? I had always entertained the idea that a car park is a place dedicated to the parking of cars. Clearly this is a ridiculous notion, and I am ashamed for having clung to it for the past six decades. 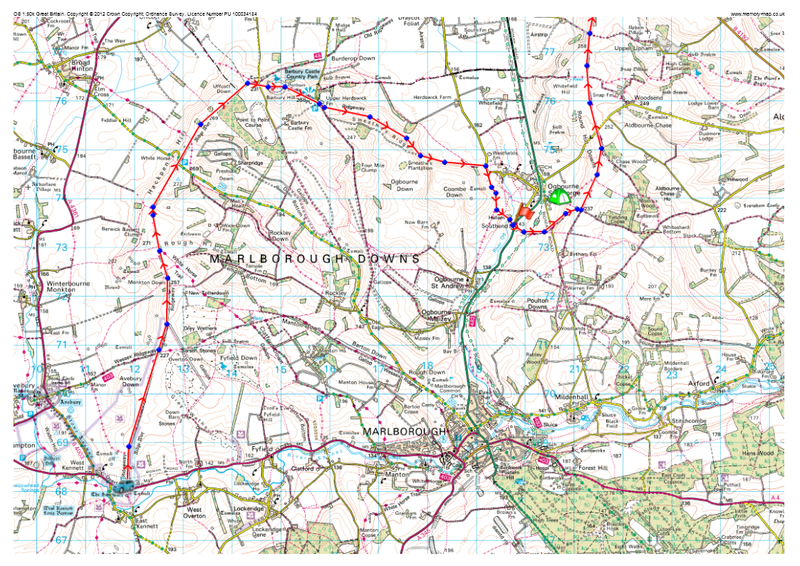 First day - the route shown is where we went on the Ridgeway, the tent symbol is where we dropped down to camp. 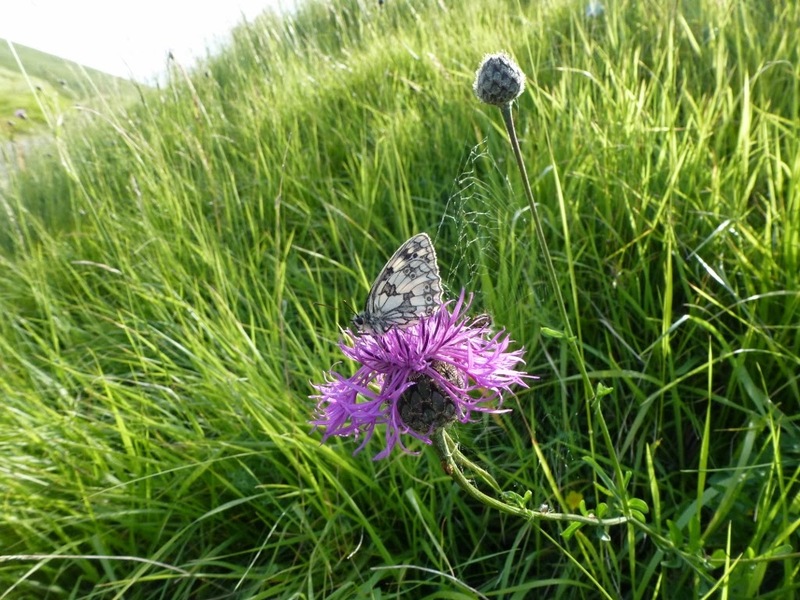 Nevertheless, pettifogging rules aside, this turned out to be a very pleasant summer walk, teeming with wild flowers, butterflies, birds and strewn with ancient forts, tumuli and tombs. Plus the views that unfold heading east just get better and better. There are a few viewless bits between hedges and trees, but not enough to spoil the walk. After the car shuttling we finally set off around 11.30 for the leisurely stroll to our first overnight camp at Ogbourne St George. The adjacent fields on Overton Down still have a scattering of Sarsen Stones, as used in the ancient monuments. It seems that 3,500 years ago the pre-agricultural landscape was very different - strewn with these mysterious boulders. They are known locally and shown on the map as “grey wethers” (a wether being a young ram) and they really do look a little like sheep grazing in the long grass. We ambled on, and in blustery winds with sunshine and showers scudding past, eventually passing through the ramparts of Barbury Castle, an iron age hill fort. It has a long history of military use, through Roman and Saxon times right up until the 1940s, when anti-aircraft guns were placed there to protect the nearby airfield. Quite important as it was here that many of the Horsa gliders were assembled for D Day, and no-one was risking the Germans getting wind of what was going on. Subsequently the airfield became a hospital base for casualties, and a military hospital remained on the site until 1996. Today the site is owned by the London Science Museum and used as a storage facility for the largest objects – hovercraft, de-activated (I hope) nuclear missiles, old computers and so on. 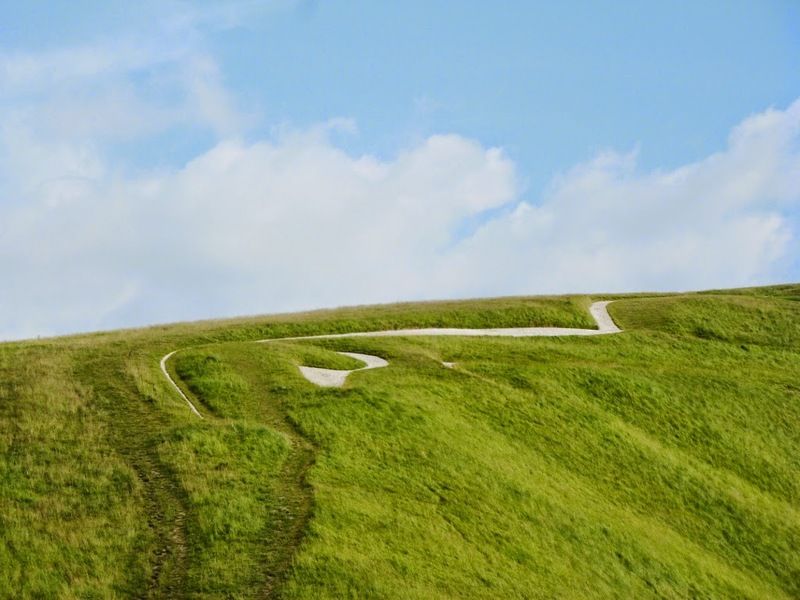 On the way to Barbury Castle we met a young woman with camera, tripod and clipboard, making careful notes. “Probably a naturalist,” I remarked. “Oooh, do you think she’s going to take her clothes off?” said the ever optimistic Al. 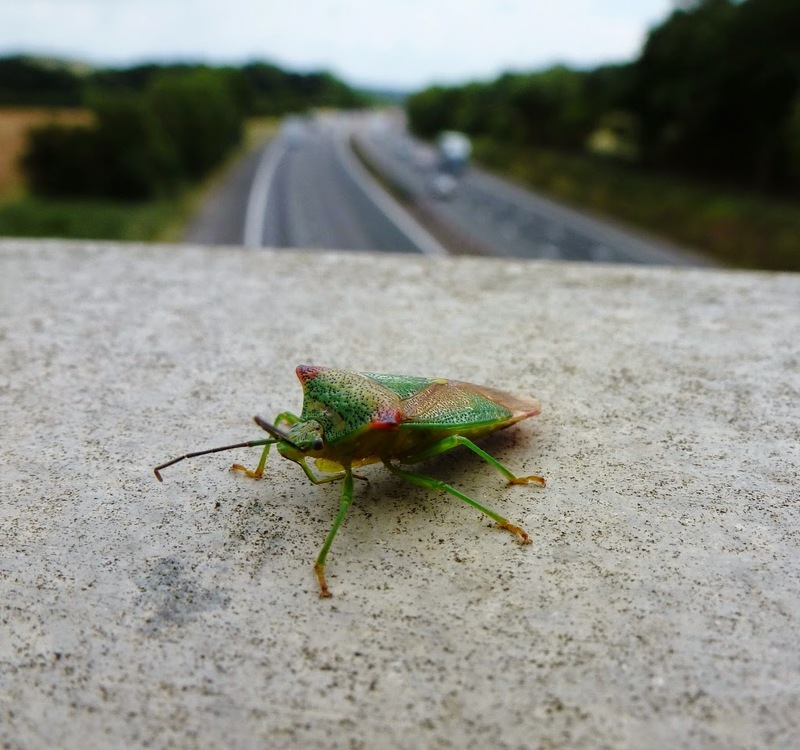 We stopped for a chat and discovered that she was engaged in a survey to assess the visual impact of covering the airfield in 160,000 solar panels. This being a designated Area of Outstanding Natural Beauty I would have thought that it would be a pretty major intrusion. Nevertheless, she explained, Swindon Borough Council has approved the scheme on the basis that the airfield is a ‘brownfield site’. I am sure that the fact that the council, via a wholly owned subsidiary, are joint partners in the project had no bearing whatsoever. So why the survey work? Such has been the outcry against this cosy bit of decision making that HM Planning Inspectorate is conducting an inquiry in September. In the meantime, much to the dismay of the council and the solar energy industry, the government has moved to cap subsidies for solar farms, so it is likely that even if they do get the scheme past the inquiry, the project will be uneconomic anyway. Al had promised a café at the farm just after Barbury Castle, and I was looking forward to a cuppa and a butty. Sadly we were faced with a weed infested roofless ruin. We later learned that the tenant had abandoned the place deep in rent arrears, and that it was subsequently vandalised and set on fire. I quietly hoped that the pubs of Ogbourne St George had withstood the economic downturn rather more successfully. And then it was a glorious descent along Smeathes Ridge into Ogbourne. 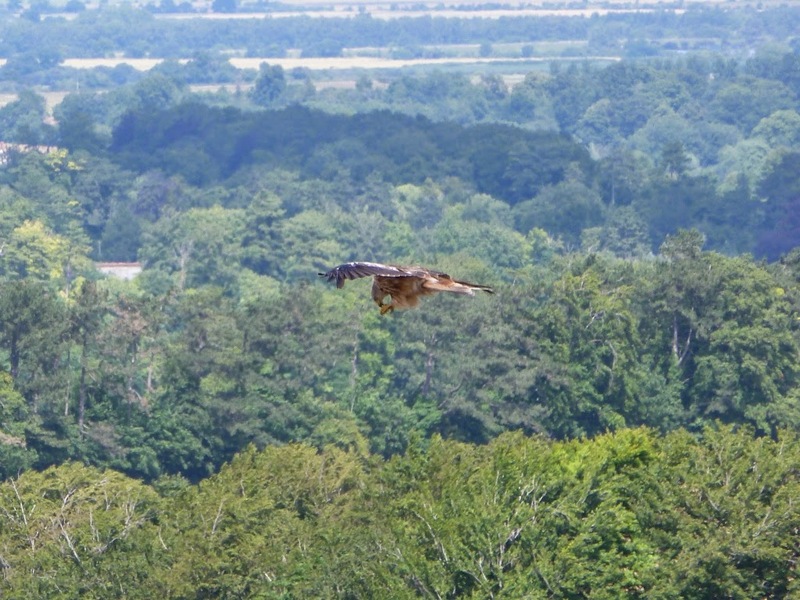 We saw a Red Kite here – rare in my part of the country, but as I was to discover, very common now along the Ridgeway. All the way dark clouds loomed over our little patch of sunshine and we could see mini monsoon showers skim along the edge of the ridge. Only a few drops touched us though until we entered the village, where it fairly fell out of the sky. Fortunately we were passing the Parklands hotel. Although it was barely tea-time we tried the door – it opened. It opened into a little reception area and beyond that a bar with a real ale tap on display. A sign over a bell push invited us to ring for service, so we did, and a very nice young lady and then the owner served us much needed hydrating fluids over the next hour or two until the rain subsided. 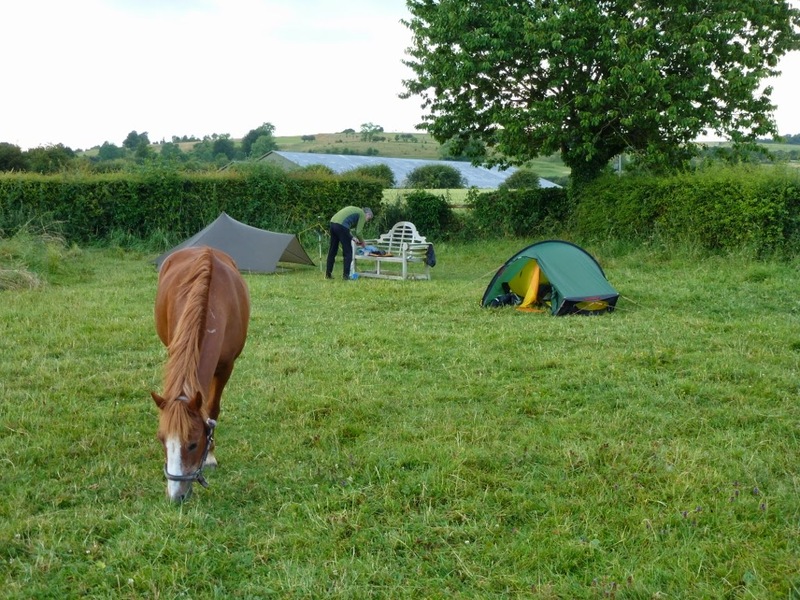 We decided to book a table and toddled off to find our camp site at Foxlynch, a horsey sort of place and indeed we shared the field with a couple of ponies and a few chickens. But the facilities were clean, everything worked and it was nice to have a garden bench to relax on. 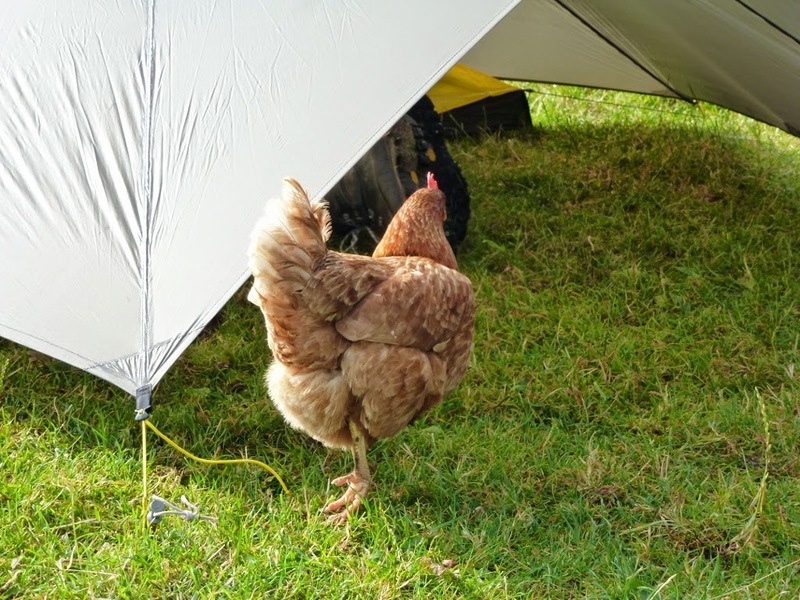 The chickens decided that Al’s trailstar would make a great love shack, and within minutes of him pitching it a hen scuttled in, quickly followed by a large red cockerel. Much squawking followed, mainly from Al, as he evicted the would-be lovers. En route to the campsite we passed a decent looking pub called “The Inn With The Well”, but having already booked our dinner we reluctantly gave it a miss and returned to the hotel, where we watched Germany thrash Brazil 7-1. The goals went in so fast that it was difficult to know whether you were watching a replay of the last one or a fresh ball hitting the net. And so to a good night’s sleep. The next morning started with a bit of a trudge along an overgrown byway to regain the ridge (NE from the tent symbol on the map) but once aloft the going was easy once more, if a bit hemmed in by hedges at first. But once past Whitefield Hill, the views opened up once more and before long Liddington Castle (another iron age fort) came into view. We paused here to enjoy a bit of a sit down in the steadily improving weather, and as Al remarked, we wouldn’t want to arrive too early at the Shepherd’s Rest for lunch and a couple of refreshing pints. At this point we were overtaken by a couple of teenage lads who we had seen pitch at Foxlynch last night. They were in good spirits and going “as far as they got”. They weren’t bothered whether they wild camped either, as they were carrying all the food they needed for their six days on the trail. They waved a cheery farewell as we settled to the serious business of a slight snooze. Timing is everything and before I had really settled in to a proper snooze it was time to set off across the M4 to Foxhill and the Shepherd’s Rest. Disaster! The pub had been transmogrified into an indian restaurant! We had heard rumours in Ogbourne, but the horrific reality was almost too much for Al, especially as we had a hill to climb now. “Maybe they’ll have a bar”, he said. “Yes, I replied, but only with bottled Cobra I’ll be bound”. 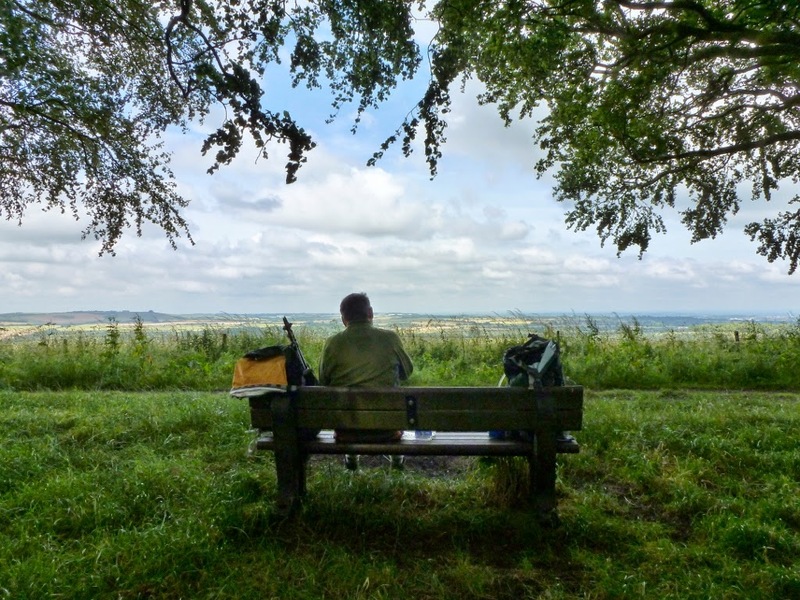 And so with heavy hearts and packs we set off and found a pleasant lunch spot by Lammy Down with a view down to Ashbourne House in the far distance. We ate and dozed in the warm sunshine to the rhythmic clanging of a nearby farm hand engaged in hitting a metal spike with a large hammer, to no obvious purpose. From here on the walk and the views get better and better still. 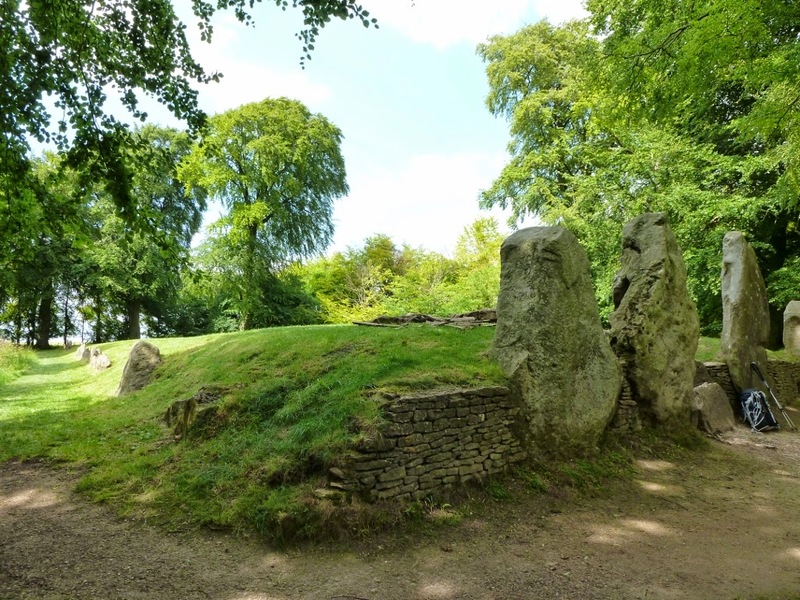 Where the path became rather unpleasantly rutted, a chap with a Ridgeway T shirt popped out of the trees and directed us along a pleasant woodland path to Wayland’s Smithy, a Neolithic Long Barrow or burial chamber. A strange and atmospheric place, set amongst ancient whispering beeches seemingly from another world and time, which I suppose it is. Two bunches of long dead flowers lay in the dark chill of the central chamber, placed there by whom? We agreed that this place had a very special feeling as we left to the murmuring of the wind in the old trees. And then we were back on the trail again, well made and maintained now all the way to the fort and prehistoric white horse at Uffington. Here we came across a large youth group led by PGL leaders. They seemed to be inner city kids, a tad out of their comfort zone, but enthusiastic and ‘up for it’. Their camp was in a field just below the fort and as we passed it en route to Britchcombe Farm we saw them being organised into teams for some sort of bonding exercises by their team leaders. 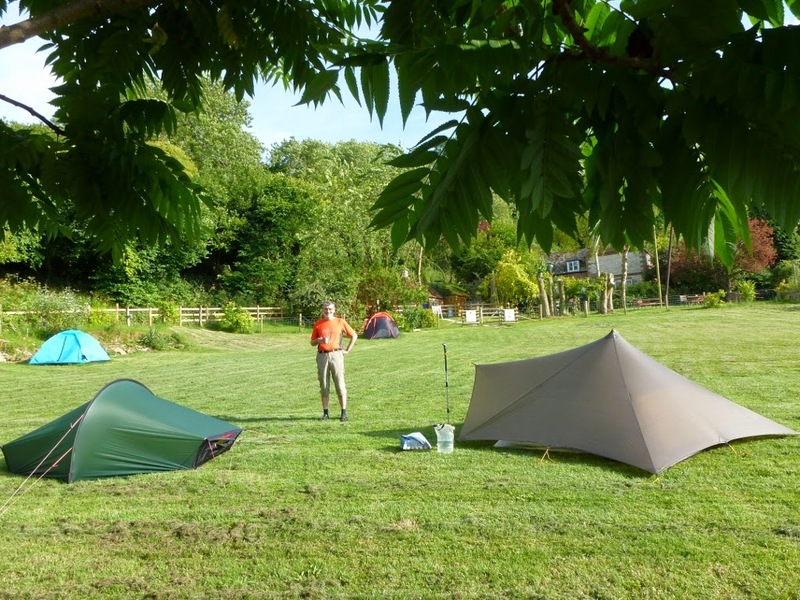 A bit of instruction on tent pitching would have been more useful, judging by the rows of tents that lurched drunkenly in the light breeze. Britchcombe Farm offered a delightful pitch for the night – a bit of a long way from the pub in Uffington, but it was worth the walk. I can thoroughly recommend the Fox and Hounds for good beer and decent unpretentious food. A village pub that hasn’t pretensions to being a restaurant, but does the job just as well, if not better than many that do. It’s a stiffish climb up the footpath back to the Ridgeway, but we accomplished it easily enough in the cool sunny morning. By the time we reached the top the sky was cloudless and the sun beat down – time to slap on the factor 30! The views north from here onwards to the A34 are stunning, stretching towards an infinite horizon under a cloudless blue sky. We were overtaken by a chap who was walking from Lyme Regis all the way to Hunstanton on the Norfolk coast. 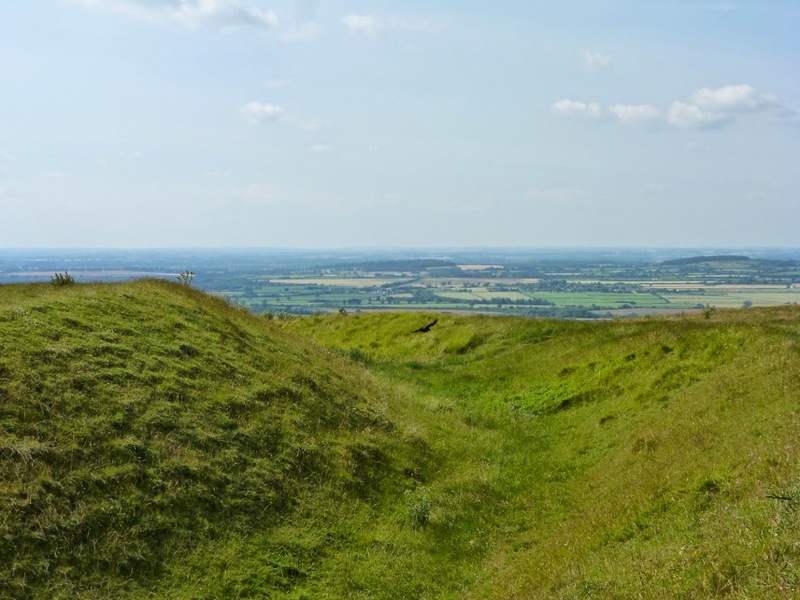 He had bivvied the night before at Liddington hill fort. He had a wedding to attend in Norfolk, and had decided to walk there. The only trouble was the date of the wedding meant that he was having to do 18 mile days. We chatted for a while and he told us about some great long distance walking in Turkey, a place we’d never previously considered. Are we there yet, are we there? The songsters came into view; the two teenage lads we had met the previous day. 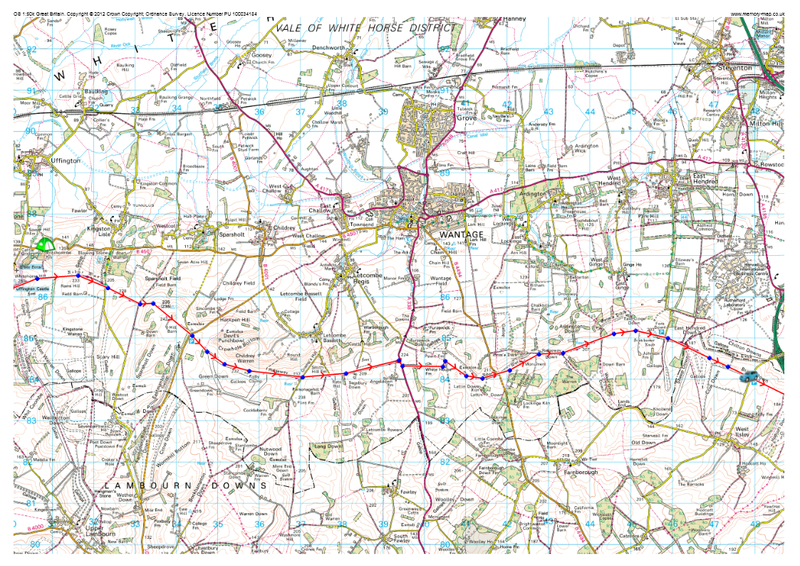 They had made a lateish start after camping in a wood and were heading for Goring (or “as far as we get”). I rather liked their attitude to this walking lark – head from here to there and leave the bit in between unplanned, to pan out as it may. And then it was just a stroll back to the car park – we could tell we were getting close by the increasing number of dog walkers bringing their animals along to crap on the path. Some picked up, presumably to adorn the trees and hedgerows with yet more of their pooches poops neatly encapsulated in little plastic bags. Why do dog owners do this?. My car was safe and sound and we were soon whizzing along to Al’s car. As we had finished all our water we called in to a pub in Marlborough for a couple of cold shandies, and I phoned home. “Ah, it’s you,” came the frosty tones of Miss W. “Did you get the messages that I left on Alan’s phone?” (my own phone generally lives in the car). Oooo –er. I sensed that I might be in a bit of trouble here. It transpired that the police had had a report about my car and the local police had been over to have a shufty. When it was still there the next night they made enquiries. Quite why the enquires were followed up at 3 am I’m not sure, just as I am uncertain as to what the appearance of Miss W at the door armed with a fly swat (the only weapon she could find) made on her visitors. I was absolutely sure, however, that the fly swat might well be employed vigorously on my return. And here’s a tip, courtesy of the Thames Valley Police. If you are leaving your car somewhere for a day or two, ring 101 and let the local police know. All those “no overnight parking in this car park” do tend to put you off, but I doubt whether the council has bothered to have them authorised by the Secretary of State for Transport, so in most cases they will be unenforceable. Certainly no mention was made by the police, and there was no parking ticket on my car. All in all this was an unexpectedly enjoyable walk. The weather helped enormously (it would be rather unpleasant in sheeting rain I reckon) and the views, history, flora and fauna all contributed to a very relaxing three days. 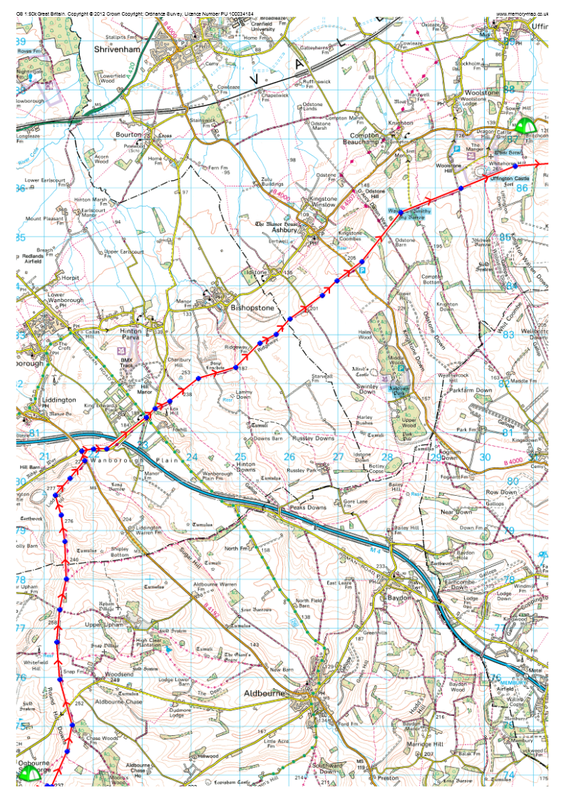 You could easily thrash along this trail, but my advice would be to potter around the monuments, drop off into the odd village pub when the fancy takes you and generally enjoy a rare bit of peace in the often overpopulated south of England. I'm told that fly swats leave interesting marks on bottoms. Will there be photographs from Miss Whiplash?? Cracking! I may steal this idea and try this out. Disappointed you haven't included an extensive kit list. I have no idea what I would need to take for an expedition in the deep south. Many cows? hate cows, me. Hopefully the waffle shaped scars on your buttocks will heal with time. 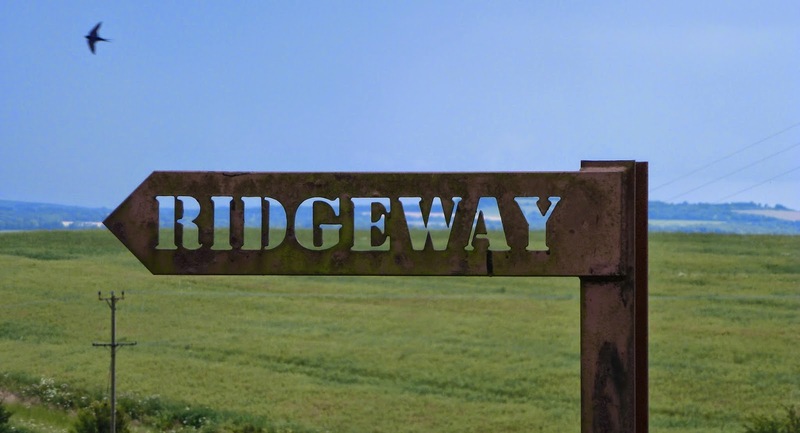 The Ridgeway was my first backpacking trip. I still have nightmares! Your pensmanship is a lesson to all, especially, Andrew! Now, what exactly did happen with the fly swatter when you got home? Sirs. With the exception of Mr Fellbound there is an unhealthy interest being shown in the effects of fly swats on the human posterior. There are other websites dedicated to that sort of thing where you can sate your depraved tastes. David - only one field with cows, and they ignored us completely, despite Al's best efforts to get one to pose for a photo. I forgot to ask. That fly swat thing? Are they available on E- Bay and which sort would Miss W recommend for someone who has never tried one before? Good about the cows. When my shiny new gear order comes I may head off to the land of chalk. Oh dear, David. As I feared the other boys have led an innocent mind down the path of debauchery and corruption. Don't go there, it will only bring you pain and humiliation. That made a very good read, Phil. Give our love to "Miss W"! Your readers are revolting. We demand another blog post as this was written back in the olden days of July 2014. Have you noticed no-one ever says 'olden days' anymore? Back in the olden days we said it all the time. Prove you are still alive, please. Go on. Prove it sir! This chap has travelled to the Continent with half his family, a team of porters and rope. 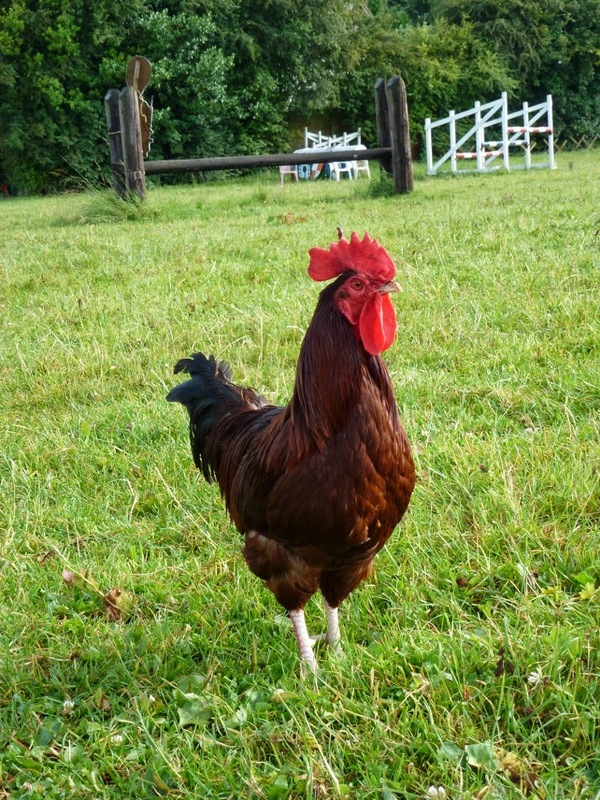 He has had arduous adventures and the blighter is keeping them from us! PS - Anyone seen Jungle lately? Is that a typo in your comment? Were you suggesting Mr Doodlecat is a 'binder' or a 'bounder'? "Your wish is my command"? I wish you would send me a fat cheque (signed), a bottle of fine malt, and a sleeping pill. The medicinal supplies can be found at Camp II. Ask for Prone.